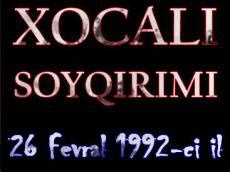 A round table called “Khojaly massacre - the most terrible human tragedy of the 20th century” dedicated to the 20th anniversary of the genocide will be held in Azerbaijan`s Embassy in Iran. Iranian officials, heads of the diplomatic corps accredited to Tehran and international organizations and representatives of city`s community have been invited to partake at the event. A documentary on the Khojaly tragedy will be demonstrated and participants will be handed over materials to the effect.